Looking for a Stock Media Wordpress plugin? Our powerful photo video selling Wordpress plugin allows you to run own digital content store. Run Eye-Candy Photo Store Wordpress themes now! Upload and sell photos, audio, videos, vectors and prints online. Mobile responsive templates based on Bootstrap framework. Upload files and sell them for the commission. 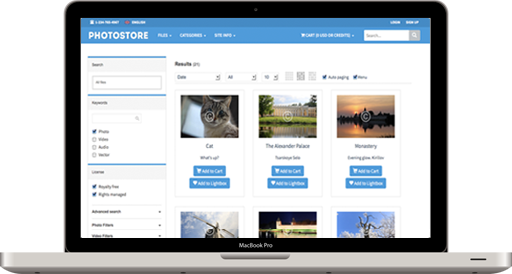 We develop two products: Photo Video Store stand-alone script and WordPress plugin. They have the same features and 90% of the same codes. Prints and Shipped products: Canvas, Framed, Metal, Acrylic Prints and Posters; iPhone and Galaxy Cases; Pillows; Duvet Covers; Shower Curtains; T-Shirts; Greeting Cards; Tote Bags. Integrated Search Stock API for Shutterstock, Istockphoto/Gettyimages, Fotolia, Depositphotos, 123RF, Bigstockphoto, Pixabay, Adobe Stock + Print-on-Demand feature. Integrated prints services: Pwinty, Fotomoto, Printful. The new versions of Photo Video Store script and WordPress plugin are available. We have added Media packages, Adobe Stock API, ElasticSearch, CSV Uploader. The new versions of Photo Video Store script and WordPress plugin are available. We added Youtube and Vimeo video previews, Direct checkout and Shortcodes (for Wordpress). We updated Clarifai recognition service to v2 and added Backblaze B2 Cloud for file storage. Also we integrated a new cryptocurrencies payment gateway CoinPayments. The new version of Photo Video Store script is available: digital collections, unlimited categories, new color search, new admin catalog page and other features. The new version of Photo Video Store script has been released: Clarifai and Imagga image recognition services; Google and Yandex login; Facebook avatar import. 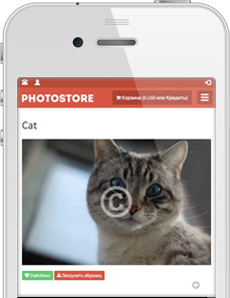 We have integrated one new paid theme in Photo Video Store script. Three different script's templates are based on the theme.